<a href="http://squarehaven.com/news/2006/06/11/Masato-Kato-The-M-Night-Shyamalan-of-gaming">Masato Kato - The M Night Shyamalan of gaming</a><br/>Duckroll takes a look at the author of the scripts for the Chrono series and how his style contributed to large parts of the Xenogears story arc. Duckroll takes a look at the author of the scripts for the Chrono series and how his style contributed to large parts of the Xenogears story arc. Many creative staff that started their careers at Squaresoft have since gone freelance or founded their own studios. The ones we hear the most about are often the directors, composers and art designers. While fans continue to push forward their claims that the main appeal of console RPGs, especially Japanese ones, lies in their focus on storytelling and character development, the actual writers behind the scenarios are often left unnoticed. One such figure who is often overshadowed by his peers is Masato Kato. Best known for his scenario work on Chrono Trigger, he went on to write and direct the Playstation sequel Chrono Cross. While die-hard fans might know of his other contributions to major RPG titles, most would not know that he was the actual writer for the final script of Xenogears, or that after going freelance he went on to handle the scenario for Baten Kaitos for Monolithsoft. Yet for those paying attention, this is one writer with a very distinct style which should be recognizable in any game he works on, credited or otherwise. When people speak of Chrono Trigger's creators, the term Dream Team often comes up. This would be the creative union between Squaresoft and Enix a whole decade before the companies formally merged. Masato Kato was never considered part of this dream team, since at the time he was a nobody - a simple grunt in the Squaresoft system. Yet the most memorable parts of the game are without doubt also the key trademarks of this unique writer. The Ocean Palace of Zeal and Crono's death are without a doubt some of the most talked about portions of the game's scenario and it is clear even without Kato's clarification (which he did, for the record), that these were specifically his main original contributions to the scenario. How is it clear? All we have to do is look at all his other scenarios to see where his trademark lies. First let us analyse the relevance of Zeal. It is easily the era and location in Chrono Trigger most easily compared to fantasy and fairy tales in general. It is a magical place, far distanced from reality or science. The history and characters there are as mystical as the place itself. That is the first Kato trademark - mystical environments. How is this related to his other works? While the Xenogears scenario was the brainchild of Tetsuya Takahashi and his wife Soraya Saga (previously known as Clio Saga), Masato Kato was in charge of converting the scenario concepts into an actual script. Along the way one of his main contributions was the establishment of the Lahan Village setting. It is interesting because throughout the entire game, Lahan Village remains on of the most peaceful and mystical places, untouched by technology and would easily pass off as a fantasy setting in any other RPG. Perhaps this was the intention, to give the game a sharp contrast between the prologue, and the rest of the adventure. We have to wonder though, with the similarities between Lavos and Deus, did Kato influence Takahashi to begin with? But the mystical factor is much stronger when Kato is given free reign, as seen in both Chrono Cross and Baten Kaitos. It is no coincidence that after being given full control of the sequel as director and writer, Kato decided to drop much of the science fiction setting that Chrono Trigger was known for, instead choosing to play with ideas of alternate dimensions and explaining much of the technology in fantasy terms involving dragons and souls. Crono's death is one of the most debated Japanese RPG plot points, right next to the death of Aerith. It seems that console RPG fans are easily impressed by death of major characters; maybe it's some sort of fetish. Nevertheless, it cannot be argued that it is pretty brave to kill off the main character of a game before it ends, even if it is reversible in some way. This style of invoking a major plot twist in the story involving the main character late in the game scenario has proven to be both Kato's strongest point, as well as what is in my opinion the weakest. While he does have the courage to drastically change the narrative by placing the main character as we know it out of action in an usually unpredictable way, he either lacks the courage to make that a permanent change, or he is held back by the management suits in charge of each production. Either way it is disappointing to watch a great idea just almost succeed, only to be reversed by some deus ex machina. In Xenogears, late in the game Fei is considered a threat and put into containment to seal away the danger forever, yet the party is willing to risk everything to free him to fight the greater evil. His power indeed proves to be massively uncontrollable and destructive, yet not only does he fail to actually do anything which would make them regret freeing him, he actually manages to control his powers shortly after. To be fair, Xenogears is not exactly the best example because Takahashi's story was about much more than Fei and the overall story more than makes up for a few conveniences in Fei's story of inner struggle. Chrono Cross is a slightly more disappointing example. For the entire first disc, the major character developments were made to create tension between the player's connection with Serge as the lead and his antagonism with Lynx as an enemy and generally a pretty nasty bad guy. Pains were taken the ensure the player hates Lynx and supports Serge in his quest, only the drive the point home hard when Serge is transfixed into Lynx's body halfway through the game. The game made you play as Lynx with a completely different party, fearing what might happen if you were to meet your friends, unable to prove what had happened. There was confusion and tension, and yet instead of playing it up as much as he should have, it pretty much just faded. Kato completely wasted the chance to make the actual twist worth all it should have been worth. Nothing can beat how he completely muddled Baten Katos though. 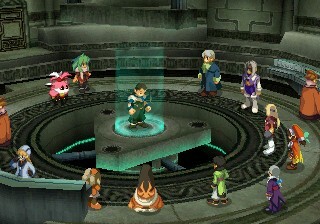 Thoughout the game the player is represented as a spirit that aids the main character Karas, but is not the main character himself. It was a tale of revenge, about how a young boy invites a spirit into his body to give him the strength he needs to conquer his foes and avenge his loved ones. Imagine the feelings of hatred, joy and amazement when it is then revealed that Karas was playing you all along. There was no revenge, it was all an act planned for a decade to gain the power of a spirit to help him pull off the greatest betrayal in videogame history. The main character backstabbing the entire party AND the player, turning into the most hated yet ingenious villain yet. While it is sad that Kato's most recent works are also his most disappointing ones, it would be unfair to let them detract from his very real contributions to some of the more popular RPGs ever. It should also be noted that he is also both directly and indirectly responsible for some of the most loved soundtracks in RPGs. While Yasunori Mitsuda composing for both Chrono Trigger and Xenogears were probably not entirely his influence, he personally chose Mitsuda to compose for Chrono Cross. He is also responsible for inspiring Mitsuda to recently compose an image album based on some vague mystical story concepts he had - resulting in the slightly disappointing but lovable album Kirite. While sharing many similarities with the mindblowing Xenogears remix album Creid, when placed side by side, Kirite just didn't compare. Faring much better is Motoi Sakuraba's contribution to Baten Kaitos, which is without a doubt one of his strongest soundtracks in the past five years. As disappointing as the scenario of Baten Kaitos was, at least it inspired the creation of a solid soundtrack, that can never be faulted! As bleak as the future looks for Masato Kato, with no plans from Square Enix to continue the Chrono series and Baten Kaitos games selling as well as the Xbox in Japan, I still wish him all the best. There is no doubt of his creative talent and ability to craft strong original concepts into workable scenarios. If he could only liberate himself from orthodox pacing and actual storytelling, I believe that one day he will be responsible for a game that will impress even the most jaded RPG fans. But if that day never comes, at least we can hope that he might inspire Mitsuda to compose more solo albums. No one's commenting on this. Is it too long? Boring? Not sarcastic enough? Tell me so we don't waste people's time. Well, I rather enjoyed it. But I haven't played Baten Katos, so I really have nothing to contribute. There's no news here. Everyone already knows this crap. It was an interesting read, I've been rather busy as of late so I didn't comment. I too haven't played Baten Katos, and being in Australia I'm yet to have finished Chrono Cross. I also haven't played Xenogears. That didn't stop me reading it though, keep up the good work. bwyuko: you knew Kato wrote the Xenogears script? And how his involvement influenced the direction of the storyline? You were able to derive common themes in his storytelling from various games? We haven't seen articles like this posted elsewhere before, which is why we're writing them. If you're not interested, I'd like to hear it so we can write something more in line with what people want to read, but don't come here claiming it's something "everyone already knows" about. Most people would be hard pressed to even tell us who Masato Kato is, let alone write about his style and contributions. Yea, it was a good read. I actually read all that. Interesting mate. I gotta check out Baten Katos, I always thought the game never really looked that good so I never thought about gettin it. Bloody Xenogears, it never came out over here in Australia. Looks like another import for me. Yes, I did. I know everything. Everything ever. Alright Bwyuko. What am I holding? Right this moment. yes bwyuko, what is he holding? A walrus with a top hat? well, that explains it, he does know everything. yeah i enjoyed reading this as well, but i too have never played Baten Katos or had any interest in doing so untill now. I've never heard of it, well i haven't heard of most things. I didn't read the review a both either, i know you did. That was the point, Nataru. Whereas his early projects were quite good (Chrono Trigger/The Sixth Sense) his later projects caused thronged suicides (Baten Kaitos/The Village). Now if you'll excuse me, I need to vomit and kill myself for remembering Baten Kaitos and The Village. I often get the same thing when I post something informative at the Compendium. If the article accomplishes what it sets out to do, sometimes there is little room for comment. At any rate, you might throw in the fact that Kato did try to push for Chrono Break back in 2001. Some people are parading around the quote in which he says the Chrono series is finished, but that was made two years before Sakaguchi came to press explicitly stating that the director of Chrono Cross was planning a new game.